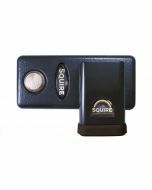 Squire's hi-security locksets offer formidable resistance against attack and corrosion. Purpose-designed to CEN European standards, they provide an integrated solution for securing vans, gates, doors, garages and other high risk areas. The lock body is made from solid hardened steel and the hasp is made of a special cast material. Impressively, a new electrophoretic anti-corrosion finish to the lock bodies gives over 200 hours salt spray resistance.